Easy to use – and it delivers an amazing result! 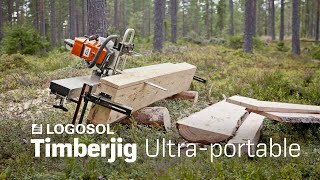 Many who use the Big Mill Timberjig for the first time, are impressed by how well it works as a portable sawmill. This equipment turns a standard chainsaw into a small sawmill. 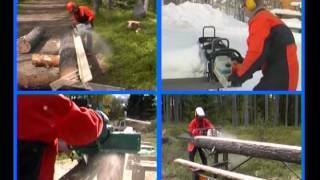 With the Timberjig you can cut logs into finished planks and boards. For a small investment, you get good results and great precision at once. The basic package includes: Timberjig and angle irons. You can confidently choose LOGOSOL as your supplier. We have sold over 25 000 sawmills and even more tools for logging and firewood management. We have over 25 years of experience as a market leader in the field of small-scale wood processing and every day we talk to customers all over the world, who realize their dreams with the help of our products. We have affordable solutions that suit most customers, whoever they are and wherever they live in the world. LOGOSOL has a wide range of products that extends from smart tools all the way to industrial production. Our customers demand the highest qualilty and machines and tools that can stand up to tough jobs. Each product is covered by a peace-of-mind guarantee: generous warranties, expert support and products that retain their high value. All our machines are CE-marked and we attach great importance to the safety of your customers. The products offered in the Smart Line are our most appreciated and most sold products. Simple and smart tools and devices that many will benefit from!